Hey there, @therealwolf here to give an official statement regarding our recent voting calculation problems. There have been a lot of questions recently about the difference between our displayed vote value which we report on our comments or display on our website and the actual received vote value shown on Steemit. This results in the vote value either increasing or decreasing. So sometimes your value gets increased to more than you actually expected and sometimes reduced to less than you should receive. (but normally still more than you send). Now, because our Steem Power is currently so high - the difference between 1% more or less is big; over $1. While we know and understand this problem - there is currently not much we can do until we have implemented a system that handles the small differences. Additionally, I want to mention that, if you check the voting value through steemnow.com - the rounding happens often in very weird ways. So keep that in mind when you calculate the value yourself. 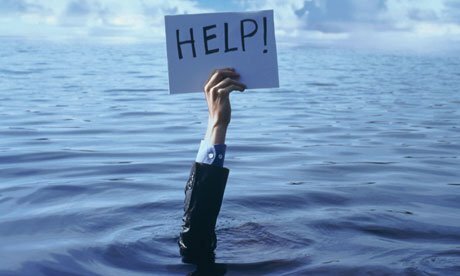 We will soon have a system in place where those problems will be fixed, but until then please keep in mind that we're doing our best to give you the best return on your investments! Until then we have reduced the Daily Limit to 5 and Weekly Limit to 15. And even while those calculation problems are happening - MinnowBooster is still giving out very good returns and you should get at least your money back. 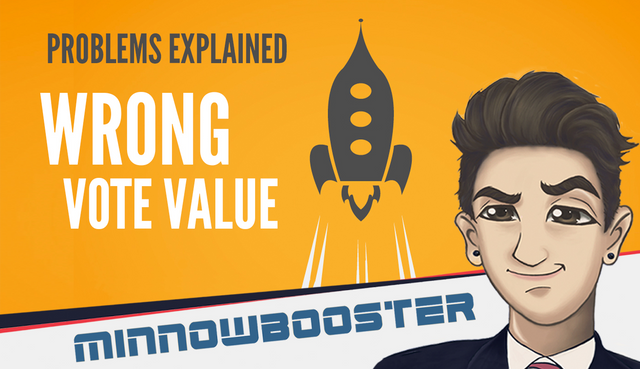 Last but not least - keep also in mind that as the Steem value and the reward balance/claims changes - the upvote value changes too and this can create a difference in comparison to what MinnowBooster comments under your post. 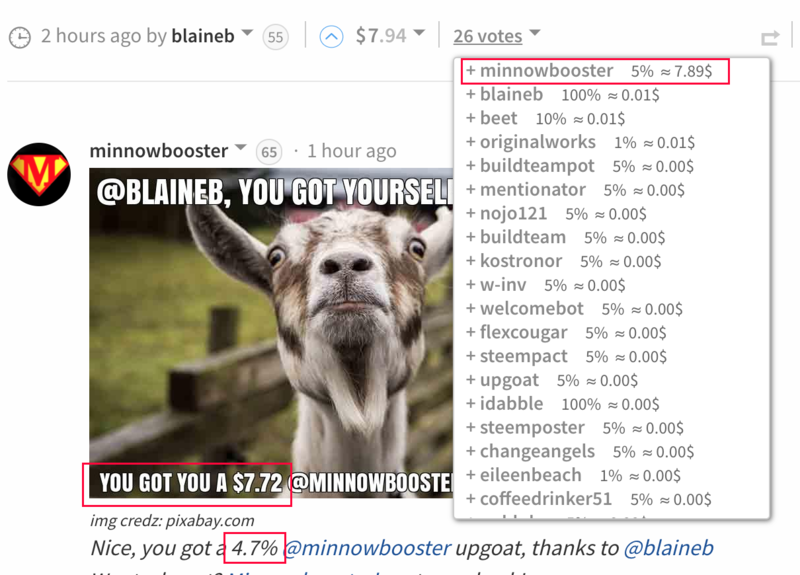 For example: If Steem has a value of $1.40 and you get an upvote from MinnowBooster - we calculate the spot value at that time. If Steem drops to $1.00 thereafter - the upvote value drops too, but the value on the comment/image under your posts stays the same, conversly if the price of Steem goes up higher the value increases but the comment value in our upvote image remains the same, because it was the spot value you received at the time. I hope this explanation was detailed enough. If you still have questions - please ask them in the comments below and I will make sure to answer them! I had a problem with the upvote function 3-4 hours ago and then I joined the Discord server to ask for help. They helped me to fix my problem in the timespan of 30 minutes and I got a full refund. Thank you too for helping me! My post was not upvoted. Please check. Thank you, @minnowbooster -- problem solved. This is what I have been noticing for many days, Earnings on your post goes down and down, it is not only the case with @minnowbooster, it is happening in general. But yeah still people receive a heavy Upvote than their investments from @minnowbooster. Looks like you got a vote, but perhaps not the one you were looking for. This is a transparent platform. Govern yourself accordingly. Thank you for the information. I am only using @minnowbooster for "upvotes" for a week and I was more than satisfied with my returns. I am new here. SO this is an outside option to how I am upvoting now? I believe you will figure it out. You have our support. Glad you admitted there is an issue, it shows transparency.Hopefully a resolution will be reached soon. This comment has received a 0.63 % upvote from @drotto thanks to: @banjo. I feel somewhat honored that my post was used for the tutorial. 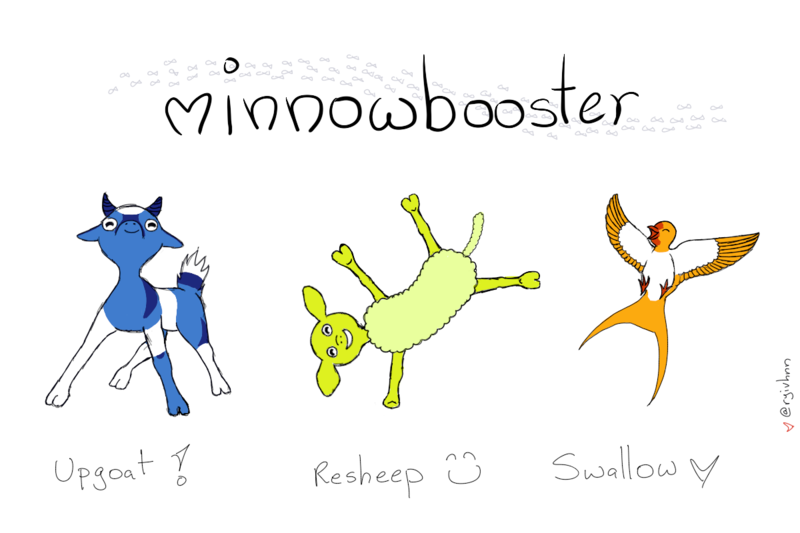 =) Thanks for the explanation, this was the first time I'd used minnowbooster and I have no complaints whatsoever! Keep up the great work and refining the system. I will be a repeat customer with service like this! I was waiting for this updated post from last few days. Hope to see some positive solution to it. This comment has received a 2.09 % upvote from @drotto thanks to: @uxair. I am a great fan of @minnowbooster. It gave Powerful upvote often. It also provides powers. I guess it would be good to try this service. do you please tell me how incise my leave and why my power diereses . i am so warred about it please help me . Hope you will fix it soon, cause with 25% goes to curation, the reward is almost always less of what we pay.. thanks. Upvote right after you post and the author keeps most of the curation rewards. If I check how many Steemians upvoted a post (for example this post), I don't see the voting percentages and the voting values beside the names. Yes, that's true. I didn't use that plugin, because I didn't know about it. Thanks for the info! Have a nice day and have a nice weekend! Thank you for clarification.Minnowbooster will remain our favourite voting bot. Upvote 5 of my latest posts and i'll Upvote 5 of yours. Once you've Upvoted, comment UPVOTED on any post and i'll Upvoted back..
Great job bro.i resteem this post.i hope this post will be in hot list.best of luck. Thanks for the informations, it seems like this is transparent, but sometimes it is also possible to get the same amount of money / prizes as the original text is waiting in the inside, and if it is also true that many people are searching for excitement with making a steemite money, such problems will cause the system to be chilled. Otherwise, most people will be dissatisfied and stay away. Thank you. Hi. Really nice to read about you.Best of luck on steemit. I have followed you and now you can follow me too. Do check out my page. It's good. Once you've Upvoted, comment UPVOTED on any post and i'll Upvote back..
You could just not add any amount in the goat image, or even don't add any image at all. This post has been ranked within the top 10 most undervalued posts in the first half of Oct 15. We estimate that this post is undervalued by $84.89 as compared to a scenario in which every voter had an equal say. See the full rankings and details in The Daily Tribune: Oct 15 - Part I. You can also read about some of our methodology, data analysis and technical details in our initial post. I hope that the daily limit of 5sbd and weekly limit of 15sbd can be increased soon as I feel that this limit is too low. I am still new to STEEMIT and looking to learn these upvoting details. Thanks for this post, it allowed me to see your video tutorials. Yaaay! I am into the video world too. You might like my stuff, take a look. either way, I like yours. thanks again! @photomania payed 5.004 SBD to @minnowbooster to buy a stealth upvote.